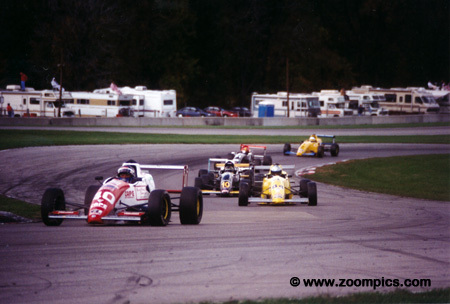 1995 was the second year that the Runoffs took place at Mid-Ohio. The event boasted a record number of entries - 692-competitors. Early in the week, the weather was sunny and warm but it rained during the Saturday morning races and remained cool for the remainder of the weekend. 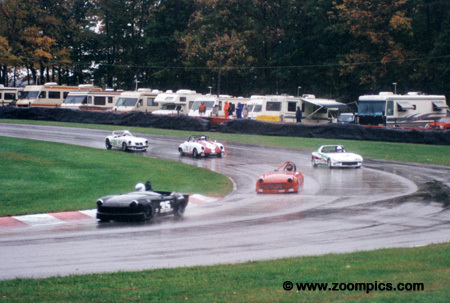 The G Production race took place in very soggy conditions. On the first lap through the 'Carousel' pole-sitter, Dean Johnson in a Triumph Spitfire leads fourth place starter Steve Sargis also in a Spitfire. This pair is followed by second fastest qualifier Thomas Reichenbach in a Fiat X1/9, Victor Skirmants driving a Porsche 356 and eventual winner Kent Prather in the white No. 26 MGA. Moving the Runoffs from Road Atlanta to Mid-Ohio agreed with Warren Stilwell. 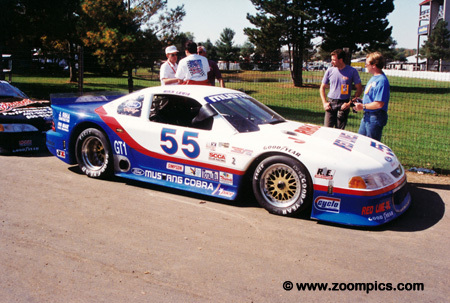 In the first year at Mid-Ohio Stilwell entered two classes – Spec Racer and Spec Racer Ford. He did not do well in Spec Racer, however, he won Spec Racer Ford. From 1994 to 2000 Stilwell was undefeated capturing the Spec Racer Ford National title seven-times. 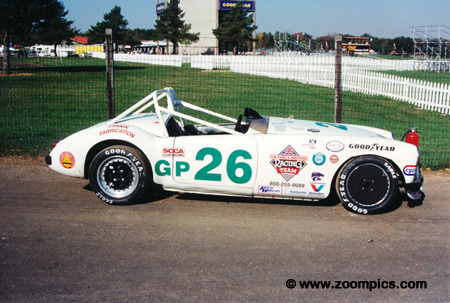 C Sports Racing competitor Alexander Smith used a Pratt & Miller chassis powered by an Oldsmobile Quad 4 engine. This motor produced less horsepower than the other engines used in the class. However, on race day it rained which meant Smith was at less of a disadvantage. From a fifth place starting position he was able to move into the lead on the second lap and win by over 35-seconds. 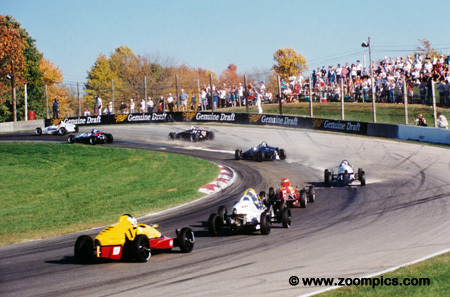 1995 National Formula Continental Champion Chris Pook leads a group through Mid-Ohio’s 'Keyhole'. Pook had returned to the US after a year of racing in Europe. He qualified his Van Diemen in the second spot but was able to lead into the first corner and maintain the position - winning by a margin of 0.694-seconds. The No. 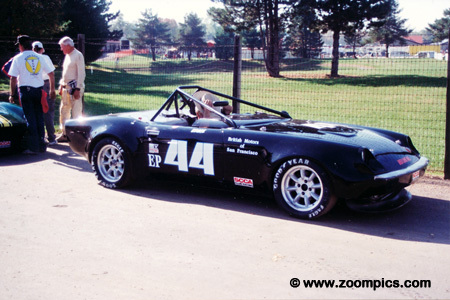 44 Jensen Healey was driven by Bruce Qvale. The Jensen Healey was produced between 1972 and 1976 using a 2-liter DOHC engine. This model won the D Production title in 1973 and 1974. 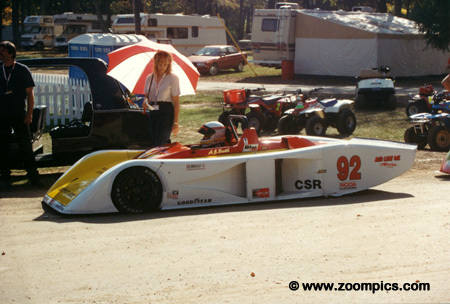 In 1995 Qvale qualified second in the Huffaker Engineering prepared car. He jumped into the lead on the first lap and never surrendered it capturing the E Production Championship. The GT2 field rounds the 'Keyhole' on the pace lap and heads for the starter’s stand. On the pole is eventual winner Dave Finch in the yellow Porsche 944. Next to him is multi-time National Champion Duane Davis driving the No. 0 Toyota Celica. 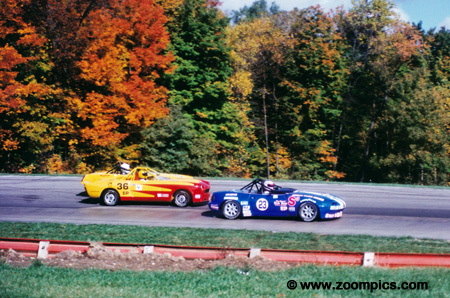 On the second row is the Sunbeam Tiger of Tom Patton and James Blakewell in a Porsche 914. The GT4 race was expected to be a tight battle for the National title as the difference between the five fastest qualifiers was 0.885-seconds. But pole-sitter Russ Theus in the No. 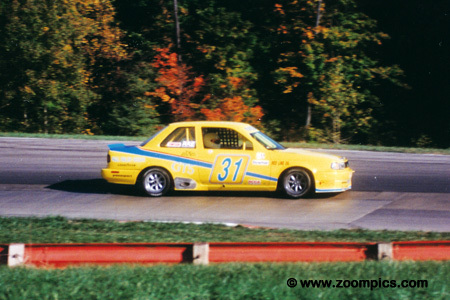 37 Toyota Tercel led all 19-laps to collect his first National Championship. The fight occurred behind him as second through fifth was hotly contested with Tom Drake taking the silver and Richard Grant capturing the bronze. The Showroom Stock A group exits turn one on their way to the starter’s flag. On the pole is Randy Pobst in the TC Kline BMW M3. Pobst borrowed a variety of cars to qualify for the Runoffs. 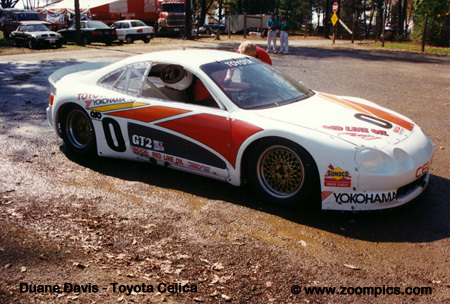 Starting alongside him is the Toyota Supra of Eric Van Cleef a former Showroom Stock C Champion. 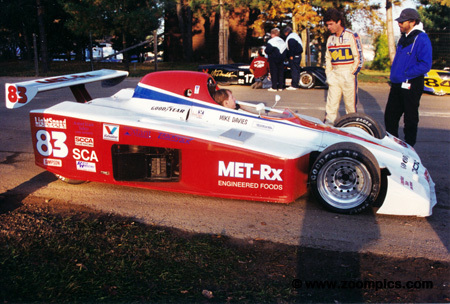 Pobst led the entire race and also recorded the fastest lap to secure his second National title. 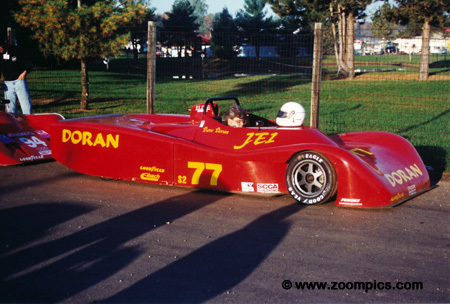 Sports 2000 was a family affair as the winning car was designed and built by Kevin Doran and driven by his brother David. Doran qualified the, appropriately named, Doran JE-1 second to class favourite, David Downey in a Lola 90. Downey led the first twelve laps but on the thirteenth Doran got by at turn seven and never looked back to win by 3.67-seconds and in the process turned the fastest race lap. Pete Peterson led all 19-laps of the GT3 race. 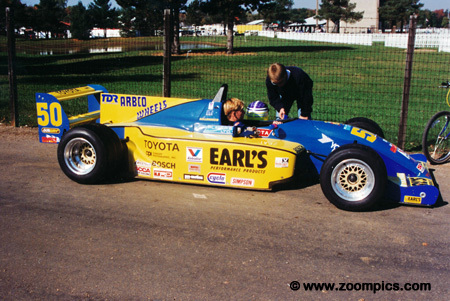 Peterson qualified his Toyota Paseo on the pole by less than 0.2-seconds over second place starter Don Meluzio also in a Toyota. It appeared that it would be a close race but Meluzio slid off the track on the first lap and Peterson finished with a 12.72-second margin of victory over Mike Lewis in a Mazda RX-7. 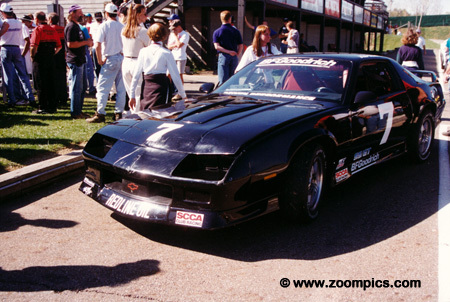 The damage to the front Peter Tonelli’s Chevrolet Camaro occurred when he made contact with race leader Joe Kent. As a result, Kent spun and Tonelli took the lead and win in Showroom Stock GT. But the victory was short-lived as Tonelli’s car was deemed to have illegal modifications - in 1994, his car was also not compliant. 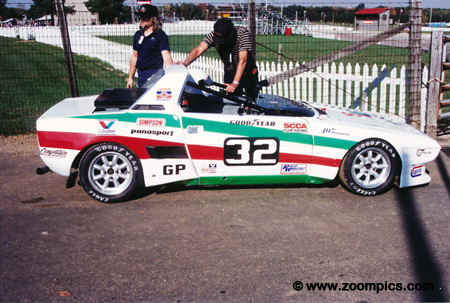 Tonelli received a nine-month suspension and was excluded from competing in the 1996 Runoffs. Qualifying sixth in G Production was Kent Prather driving an MGA. Qualifying took place in the dry conditions but it rained during the race. Prather took a cautious approach and found that the superior torque of his car provided him with an advantage in the rain. He was able to move out front and win by 11.10-seconds. This was Prather’s second National Championship in G Production. The first lap into the 'Esses' and the leader in GT5 is pole-sitter Doug Peterson in the Fortech Mini. Slotting into second is fourth fastest qualifier Richard Kraus – the 1993 GT5 champion. Rounding out the group is the No. 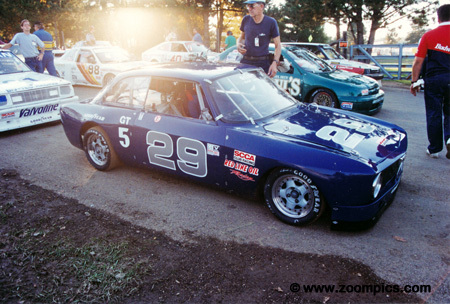 31 Nissan Senta of David Walsh and Jim Rauck’s Nissan 210. The GT1 grid enters the Esses on the pace lap – twenty cars in all. On the pole is the Ford Mustang of Wayne Ackers and next to him is Michael Lewis also in a Mustang. 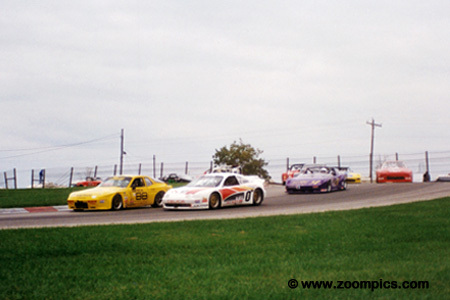 Behind the front row in third is Gary Stewart in a Chevrolet Camaro and another Camaro driven by Bill Gray. An untidy field on the first pace lap meant the GT1 field did not get the green flag until the next go around. 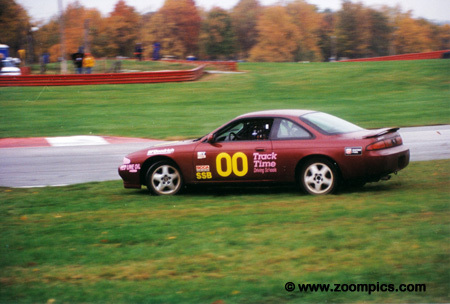 David Daughtery qualified his Nissan 240SX in sixth for the Showroom Stock B race. 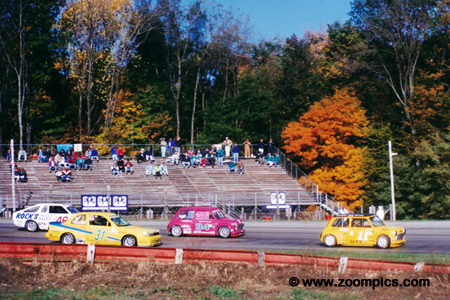 On the first lap, many of the front runners slid off the track at the 'esses' which allowed Daughtery to take the lead. Midway through the race Daughtery dropped to third behind Michael Galati and the Volkswagen of Jody Lift. However, Galati retired with brake problems and Lift was disqualified due to modifications to the cylinder head. This was Daughtery’s third consecutive National title – he won SSB in 1993 and in 1994 SSA. Fifth place qualifier Max Lagod in the No. 33 Chevrolet Camaro challenges Bill Gray for position heading into the Esses. These two ran in close quarters the entire race with Gray having the advantage. At the checkered flag, Gray finished second in GT1 with Lagod taking third – they both benefitted from the late race misfortune of race leader Wayne Akers. The No. 50 Ralt RT-40 was driven by Robert Sollenskog a former Sports 2000 competitor who had finished on the podium in two previous Runoff starts. He started on the pole almost 1.5-seconds ahead of second place qualifier Gregg Harrington. Sollenskog did not move into first until lap-8 and had a comfortable lead until lap-15 when he lost his engine. This allowed 76-year old Dan Carmichael to take the Formula Atlantic National title. Wayne Akers was having a perfect Runoffs week until lap-18 of the GT1 race. 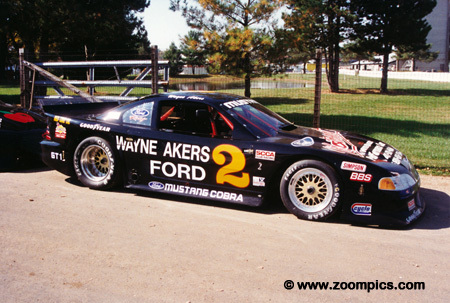 Akers had qualified on the pole in his Ford Mustang and recorded the fastest race lap. But on lap-18, he was passing a back-marker and went off course. Akers was able to return to the track and finish fourth in GT1. Al Beasley Jr. took advantage of the misfortune of his competitors to finish second in C Sports Racing. Beasley started fourth in a Beasley B2 and was passed by eventual winner Alexander Smith. He was seventh in the early going but many of the competitors spun which eventually elevated him to the second spot. F Production was eventful as there were four different race leaders. Qualifying second in F Production was the No. 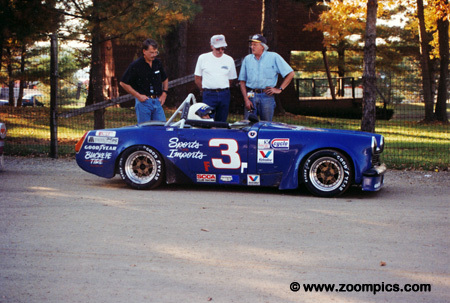 3 MG Midget of Rick Haynes. 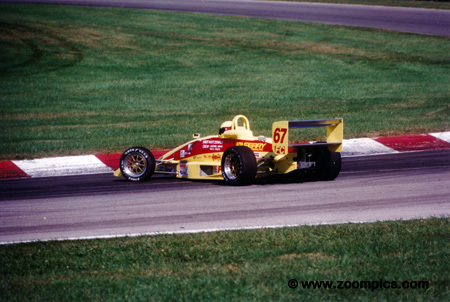 Haynes was in the lead at the finish but during the race made contact with Joe Huffaker - which caused Huffaker to spin. As a result, Haynes was penalized which moved him to third. 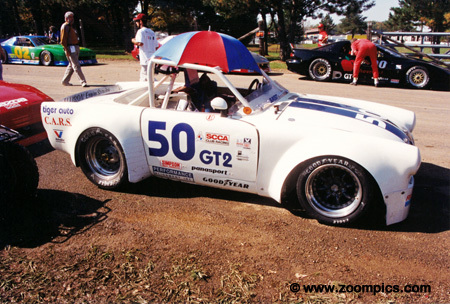 After the penalty Harold Flescher also in an MG Midget was declared the National Champion. Dave Weitzenhof spins his Citation in the 'Carousel'. Weitzenhof a seven-time National Champion was the odds- on favourite to win the Formula Continental title. He was in a tight battle for the lead with David Pook and Steve Knapp but midway through the race his suspension collapsed which caused him to retire. While the other GT5 competitors were crashing and breaking seventh place starter, Jack Beck avoided all the drama. He ran a steady race in his Alfa Romeo 1300 to take the final position on the podium. 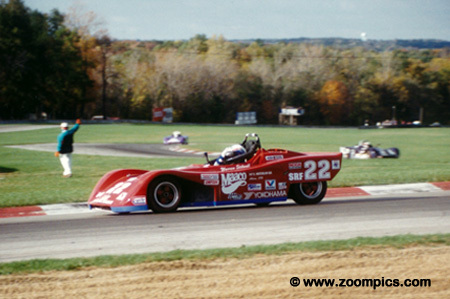 Mike Davies race was straight-forward – he was fastest qualifier, set the fastest race lap, led all 19-laps and finished over 13-seconds in front of second place Augie Pabst to win the Shelby Can Am National Championship. 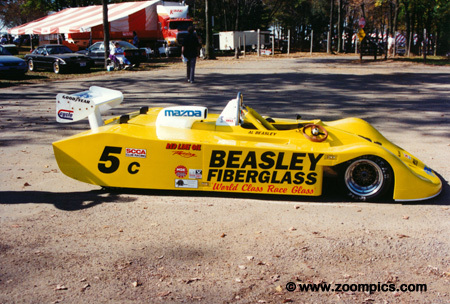 This was Davies sixth national title and his third in Shelby Can Am. 1996 would be the last National Championship race for this class as there were only 3-entries and poor participation during the season. Contenders for the E Production crown enter the 'Esses'. Leading this group is the No. 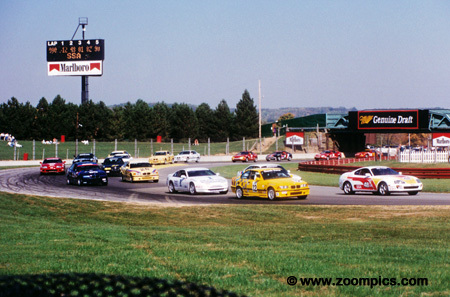 23 Mazda Miata of Terry McCarthy who captured the pole - almost 1.5-seconds quicker than the second place starter – he would finish second in the race. In the No. 36 Fiat Spider is John Baucom, who started and finished third. Obscured by Baucom is the MGB of Dave Headley. Headley qualified fourth but retired early after contact. Finishing second in the GT2 race was Tom Patton driving a Sunbeam Tiger. Patton qualified third and was able to keep winner David Finch in his sights finishing just 1.843-seconds behind him. The Sunbeam Tiger, based on the Sunbeam Alpine, was produced from 1964 to 1967. The early cars were powered by a 260-cubic inch Ford while later models used Ford’s 289-cubic inch engine. The development work on this model included the talents of Carroll Shelby. GT5 proved to be a very exciting race. David Walsh in the No. 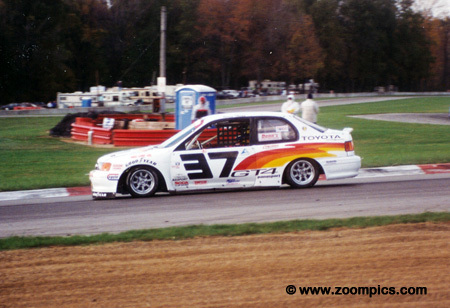 31 Nissan Sentra and Joe Huffaker in the Fortech Mini took turns leading the race which included a number of incidents. Huffaker fell to third after being hit by another competitor but regained the lead and Walsh dropped to third after spinning in another competitor's oil. But in the end, it was Walsh who captured the GT5 crown. The No. 32 Fiat X1/9 was driven by 1991 G Production National Champion Thomas Reichenbach. Reichenbach qualified in the second position for the G Production race. At the start fourth place qualifier, Steve Sargis passed him for second. This was not to be his year as he completed only 9-laps and was classified eighteenth in the final race standings. GT2 polesitter David Finch leads the field through the 'Keyhole'. 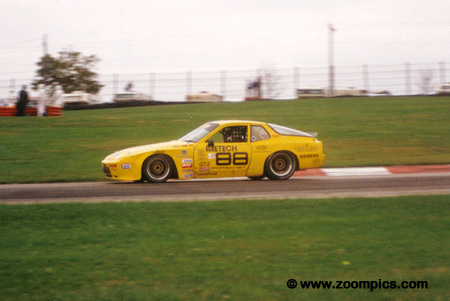 Finch led the entire race in his Porsche 944 but was hotly pursued by second fastest qualifier Duane Davis in a Toyota Celica and third place starter Tom Patton in a Sunbeam Tiger. Finch prevailed securing his fourth National Championship in GT2. As usual, the Tracer team was one of the favourites to win the C Sports Racing National Championship. Qualifying on the pole was Chuck Billington in the No. 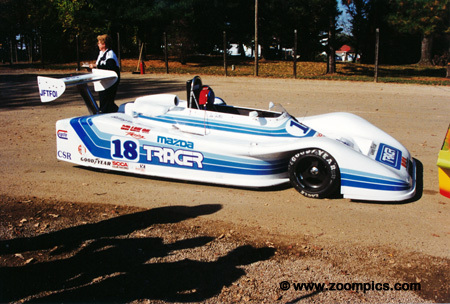 18 Tracer TR-2 and his teammate, in a similar car, Tom Foster started third. Billington led the first lap but had an early spin and although he was able to recover he made contact with another competitor and retired at corner eleven in the tire wall. This represents only a small segment of the fifty-two car starting field for the Formula Vee race. Jon Adams in the Adams Aero qualified third but led the entire 19-laps winning the national title by over 5-seconds. Second was Bill Wallschlaeger in a Laser MkII and Jacques Lazier, the pole-sitter and 1996 National Champion, was third in Mysterian M2. A blown engine at the end of the back straight midway through the American Sedan race left a number of cars badly damaged. The Chevrolet Camaro of Chris Bernard spun and stopped facing race traffic. He was hit nose first by Gregg Ditzian also in a Camaro. 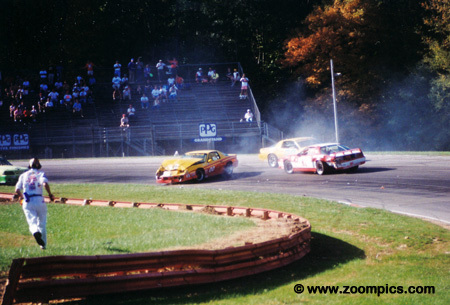 This incident resulted in a full course yellow to remove the cars and clean the track. 1995 was the first year that American Sedan was recognised as a National class. Qualifying on the pole was the No. 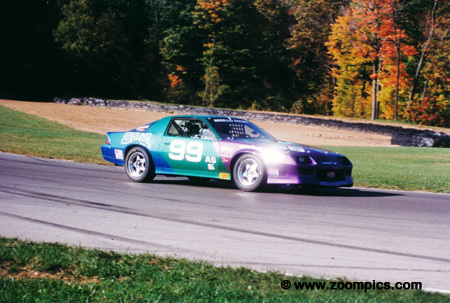 99 Chevrolet Camaro of Jay Morris. Morris built a comfortable lead but a late race full course yellow bunched the field. He spun into the gravel on lap eighteen after being pressured by eventual winner Kerry Alexander. Finishing second was racing veteran Joe Varde with Johannes van Overbeek completing the podium. Qualifying second in GT1 was Michael Lewis. He ran in this position for much of the race until the eighteenth lap when race leader Wayne Akers went off course. Lewis in his Ford Mustang inherited the lead and would keep it for the final two laps to win the GT1 National title. 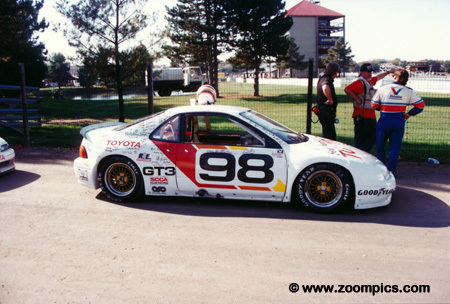 This was Lewis’ second national championship – he scored his first in 1992 driving a GT3 Mazda RX-7.